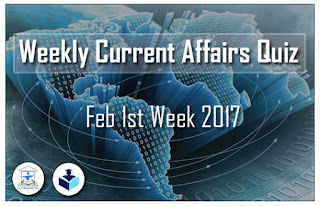 Dear Readers, Weekly Current affairs Quiz was given here for Upcoming SBI PO / TMB Exam 2017 . Candidates those who are preparing for all competitive and banking exams can use these questions. 1). Water Taxi Services which is recently launched in ______river . 2). Name the actress who has been recently appointed the new ambassador of the Swachh Bharat campaign. 3).Two new All India Institutes of Medical Sciences (AIIMS) institute to be set up in _______ and _______ . 5). Which among the following country issued ban on visas for travellers belonging to Pakistan, Afghanistan, Iran, Iraq and Syria to prevent entry of radical Islamic terrorists. 7).February 3rd is celebrated as __________ ? 9).Indian snooker player Pankaj Advani recently won the Indian National Snooker Championship title , which is his ___ national title. 10). Who has been appointed as the Chief Business Officer of Uber. 11). Name the shuttle player who recently became become the World No 1 Junior Badminton player. 13). Theme of world cancer day 2017 ? c) Together , We fight for it. d) We can. I can. 15). Name the former Central Bureau of Investigation director who recently passed away ? 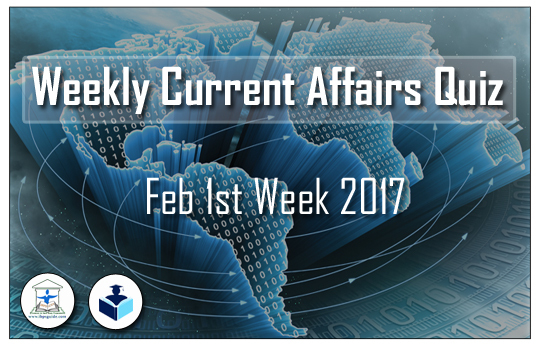 17).Who has been appointment as the Principal Economic Adviser in the Ministry of Finance? 18).World Cancer Day is celebrated on ? 19).Name the England cricketer who recently honoured with Commander of the Most Excellent Order of the British Empire (CBE)? 20). Which of the following has recommended Reserve Bank of India to reduce the interest rate by 0.75%? 22). Which of the following states has recently launched as scheme called Chief Minister Samagra Gramya Unnayan Yojana, (CMSGUY)? 27). ________ state government has introduced civil service awards for state government employees who excellence in public administration. 29). _______ has won Women’s Singles title of 81st Senior National Badminton Championships tournament played in Patna. 30). __________ has been appointed as the the acting CEO of Prasar Bharati.